I often walk down the over 200 stairs to Tower Beach after a long day of staring at a screen. Yesterday I took my tripod which I recently brought back to BC from my parents house. Crouching on the beach in front of a rock, waiting for the small waves to lap over the top was a kind of meditation. In an interesting CNN Belief Opinion post, Craig Detweiler discusses the coming together of sacred places and current technology such as cell phones. For the Spiritual Ecologies and New Cosmologies Convergence I am planning, we are asking folks to post Instagram photos at #sacredecologies or #spiritualecologies. What are the ethics behind photography and digital media in sacred places? So far no one has posted a selfie to these hashtags, but would that be inappropriate? I live on the western most tip of Point Grey in Vancouver. To get to the beach, I take a long stairway through the Pacific Spirit Regional Park that descends the forested sea cliffs. Many days I feel my feet carry me from my desk toward the setting sun and the soft hush of the shore. Each time I emerge from the tree covered stairway onto the rocky beach, it feels as though the sun were setting on the first day of creation; when time was not so worried about passing; the sun seems to perch over the northern mountains for hours. Yesterday I was lucky enough to watch two Great Blue Herons fish the lapping shore. Walking up and down with spells of statue stillness and then lightning strikes of their beaks. The sea gulls hung around awkwardly, hoping for a dropped fish, but also mimicking the Herons along the small waves, their small legs too small keep them above the tiny crests of the waves. I took my shoes off and stood ankle deep in the frigid water. A group of Harbor Seals played off the coast, and one curious seal cruised the shore line keeping an eye on me, perhaps wondering if I was a smelt fisherman. As the sun sunk, four more Herons arrived, flying over my head to roost in the alders. One of the Heron’s I had been watching, finished for the day, came and perched on a protruding log near me. We just watched each other as the sun set. I snapped photos, and she shifted legs lazily. 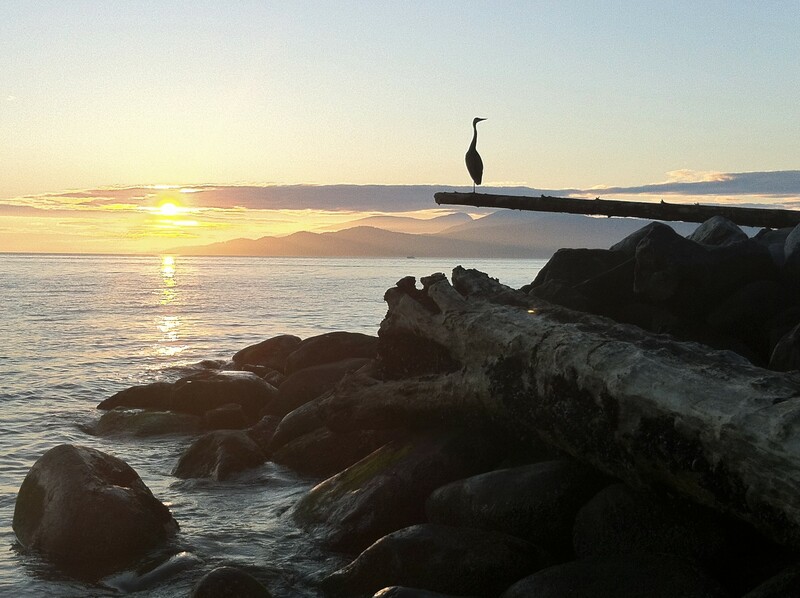 Standing on a smooth rock the rising tide washed over my feet and I watched the sun and the Heron watched me. It was a moment of grace that I had not expected.